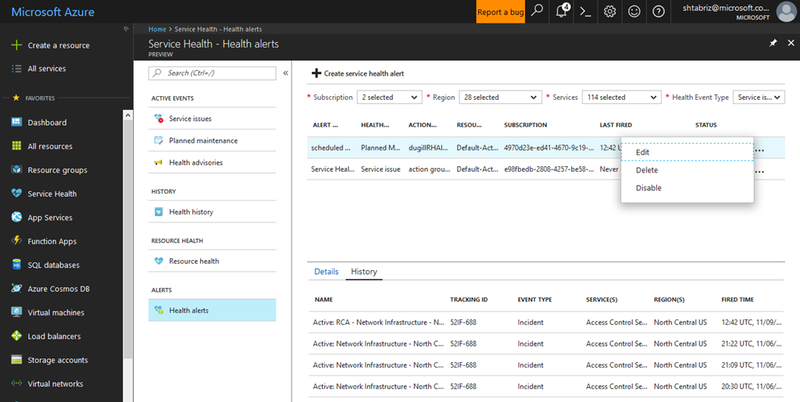 When an Azure service incident affects you, we know that it is critical that you are equipped with all the information necessary to mitigate any potential impact. 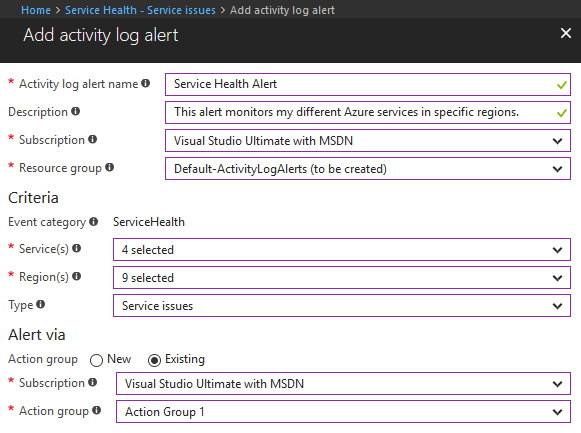 The goal for the Azure Service Health preview is to provide timely and personalized information when needed, but how can you be sure that you are made aware of these issues? Easily create and manage alerts for service incidents, planned maintenance, and health advisories. Integrate your existing incident management system like ServiceNow®, PagerDuty, or OpsGenie with Service Health alerts via webhook. So, let’s walk through these experiences and show you how it all works! 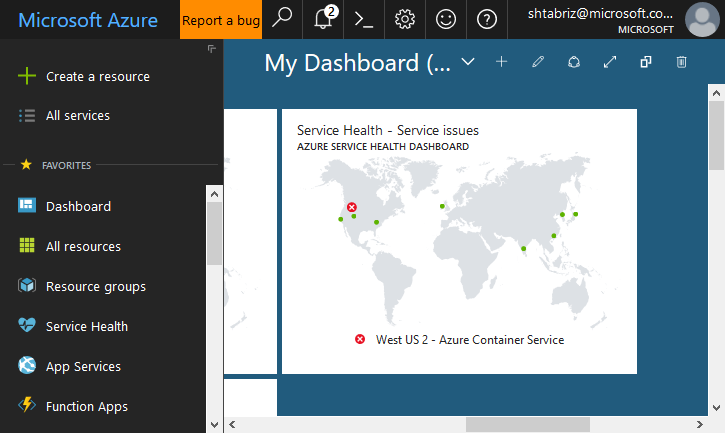 Let’s say you visit the Azure Portal, and you notice that your personalized Azure Service Health map is showing some issues with your services. You can gain access to the specific details of the event by clicking on the map, which takes you to your personalized health dashboard. Using this information, you are able to warn your engineering team and customers about the impact of the service incident. If you have not pinned a map to your dashboard yet, check out these simple steps. In this instance, you noticed the health status of your services passively. However, the question you really want answered is, “How can I get notified the next time an event like this occurs?” Using a single click, you can create a new alert based on your existing filters. Click the “Create service health alert” button, and a new alert creation blade will appear, prepopulated with the filter settings you selected before. Name the alert, and quickly ensure that the other settings are as you expect. 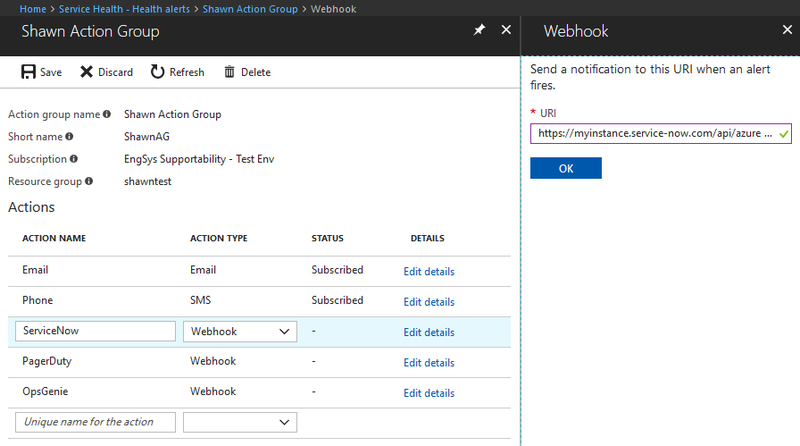 Finally, create a new action group to notify when this alert fires, or use an existing group set up in the past. Once you click “OK”, you will be brought back to the health dashboard with a confirmation that your new alert was successfully created! In the Health Alerts section, you can find all your new and existing Service Health alerts. If you click on an alert, you will see that it contains details about the alert criteria, notification settings, and even a historical log of when this alert has fired in the past. If you want to make edits to your new or existing Service Health alert, you can select the more options button (“…”) and immediately get access to manage your alert. During this process, you might think of other alerts you want to set up, so we make it easy for you to create new alerts by clicking the “Create New Alert” button, which gives you a blank canvas to set up your new notifications. 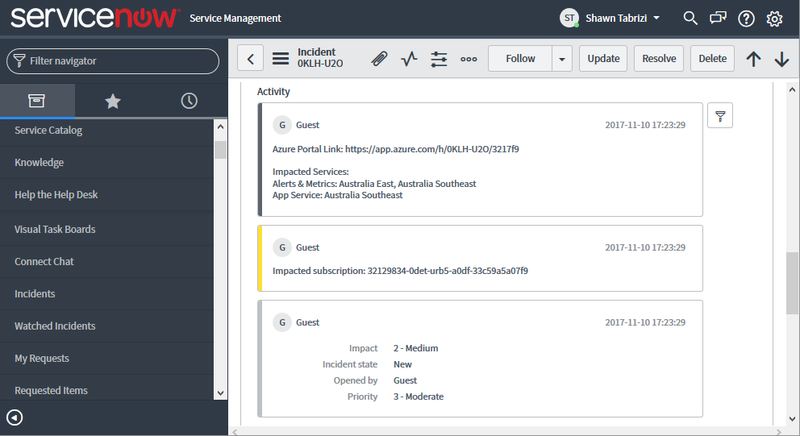 Some of you may already have an existing incident management system like ServiceNow, PagerDuty, or OpsGenie which contains all of your notification groups and incident management systems. We have worked with engineers from these companies to bring direct support for our Service Health webhook notifications making the end to end integration simple for you. Even if you use another incident management solution, we have written details about the Service Health webhook payload, and suggestions for how you might set up an integration on your own. For complete documentation on all of these options, you can review our instructions. Once the alert fires, your respective incident management system will automatically ingest and parse the data to make it simple for you to understand! 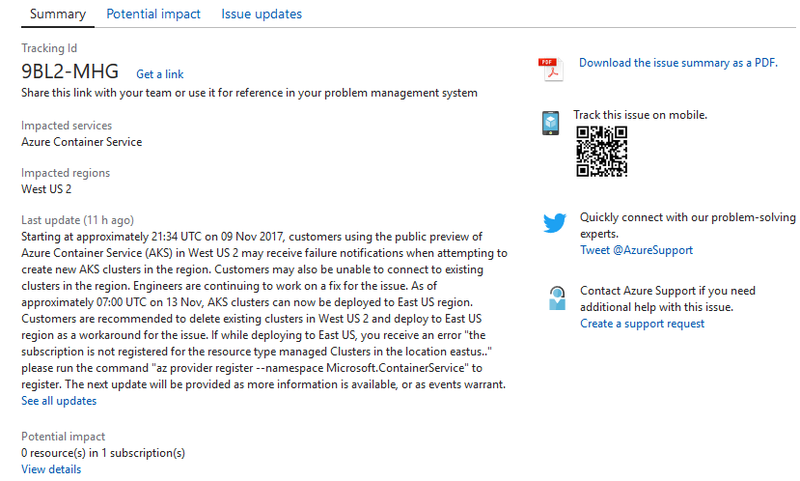 I hope you can see how our updates to the Azure Service Health preview bring you that much closer to the action when an Azure service incident affects you. We are excited to continually bring you better experiences and would love any and all feedback you can provide. Reach out to me or leave feedback right in the portal. We look forward to seeing what you all create!